Long time TYRANT supporter and all around cool dude, Craig Samuels, is heading to the West Coast; San Francisco to be exact. Congrats to Craig! He will be attending the Academy of Art University pursuing film. Craig departs CT on the 19th of August...which means we'll be having a rad "Bonvoyage Party" for him sometime before then at a local watering hole (still to be determined). This one is going to be sick! 2 days! 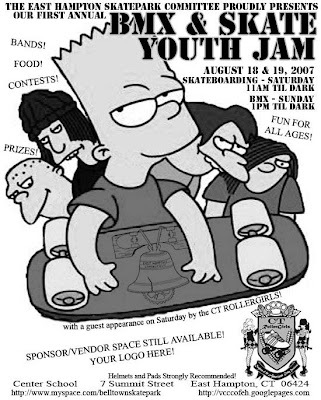 Saturday is SKATE ONLY. Sunday is BMX ONLY! 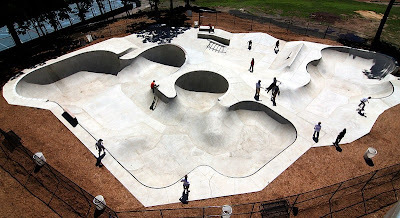 Help East Hampton raise some dough for an insane cement park! Come get rad..and bring some spending money!!! Lots of food for sale, vendors selling awesome product, The Connecticut Rollergirls and more!!! For those of you who also skate a little, the Stamford Park is finally open. I'm so livid that they aren't letting bikes in that I may actually dig my skates out. I have to get into the park and check it out first hand! Check out the new TYRANT vinyl decals that will be available in the very near future. These decals are 15" x 4", the perfect size for your car's back window, windshield, hood or your backyard ramp. So I caught word that Craig Samuels got the OK from the doctor to start riding again. Craig is an animal! He had both knees operated on at the same time a few months ago and I know it wasn't a fun rehab. Expect to see Craig blasting toboggans like this in the very near future! Pete Krol has some new ramps in his backyard that the locals have been sessioning on a regular basis. After a lousy day of road racing I stopped by Pete's to shoot some film. It was pretty much the Jake Lineberry show, the kid was going huge. Matt Jones, Cody Caron, and Pete Krol were also boosting really high and the new backyard line looks really fun. Except more photos really soon! I'll be heading their to ride in the near future. For now, head over to TYRANT's Flickr to view the photos I shot. So I was at my parents house yesterday and I decided to take a shot of my old stomping ground, "The Pit". Back when I was living at home I had a fun little backyard set-up down in a gully on the back of our property. I built a 4 foot box jump, dirt jump, random wedges, and had a 4" x 4" with angle iron drilled in it cemented in the ground as a rail. Well those old ramps haven't been ridden in 7 years and Mother Nature has taken back over. It's fun to think back to the good old days. 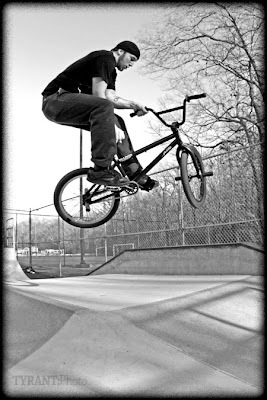 Tina and I rode the Newington Skatepark today super early in the AM...it was empty! It was my first time on the BMX bike in over a week since I've been riding road daily to get in shape for the races in the coming weeks. T looked really comfortable today and was bombing around the park at mach speed....eventually resulting in a pretty gnarly crash! but she's ok. Check out the photos we shot at: TYRANT's Flickr.